Grumpy’s Classics Cave: 'Dry' my a*se! I mentioned to a friend recently that I'd done a dub of this record and he called it, 'Dry'. It's a criticism I've often heard of Foldes and I don't quite understand it; I prefer to think of him as 'classical'. He's one of my favourite pianists - and sorely neglected in CD reissues. DG seems to think he's only fit for compilations of the 'Liebestraum', 'Für Elise', 'Passion for Piano', and 'Piano Weekend' variety. They can't be bothered to reissue his milestone solo Bartók cycle (just one Dokumente CD that's been around for years) and for some incomprehensible reason they never marketed the superb if unnecessarily selective Original Masters 'Wizard of the Keyboard' twofer in the UK - I had to buy mine from abroad (and three nanoseconds later it's been deleted, anyway, though you can buy it as a FLAC download, which is a small mercy - get it, the Stravinsky Sonata and Barber Excursions are my absolute tops for these works). So, for grumpy fellow Foldes fans and sceptics, here is his fine 1958 'Emperor' with Ferdinand Leitner, from a stereo Heliodor LP published in 1959, which I picked up in a local charity shop recently. I haven't put up the filler, the little Sonata in G Op.79, because it's very short, not quite so interesting and the nitwit who last owned this disc managed to slather that bit in some annoying gunge which our little miracle helper ClickRepair can't deal with. Otherwise, ClickRepair has done a great job and I find the 1958 sound remarkably good. Can't say the same for the grungy and depressing cover - how many copies did this sell? Also, I specially bought an A3 scanner so I could do LP covers: well, bravo the person at Mustek who put a raised, chamfered edge round the platen just high enough so that LPs, which don't fit by a couple of mm, sit half on and half off the platen: not only is one or the other side chopped off but the other is also out of focus. If you wanted to help users frame their paper originals, 1 mm, unchamfered, would have been fine. The software is also beyond dire. 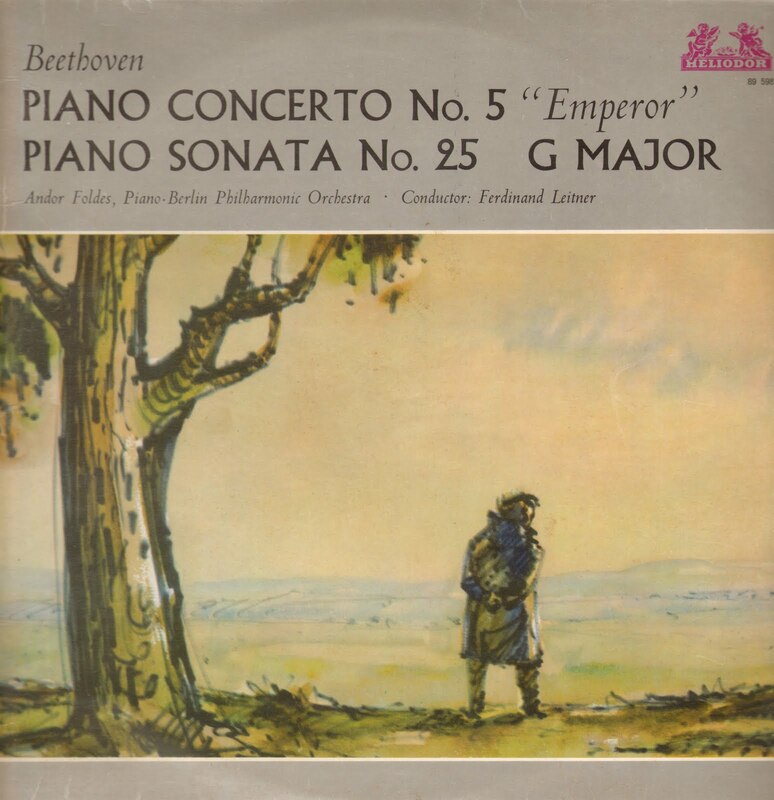 Today I have posted on my blog Piano Concerto No 1. While not the most wonderful "Emperor" I have ever heard, it's one that's been in my collection since the late 1960s and I never regret pulling it off the shelf for a listen. My copy is an American Deutsche Grammophon; at the time of its issue DGG was pressed and distributed in the USA by American Decca. Their pressings were problematic; there is a constant "grainy" noise and pops-clicks on mine.